Britain has become a nation of painkiller addicts, with soaring numbers of pills handed out by GPs. 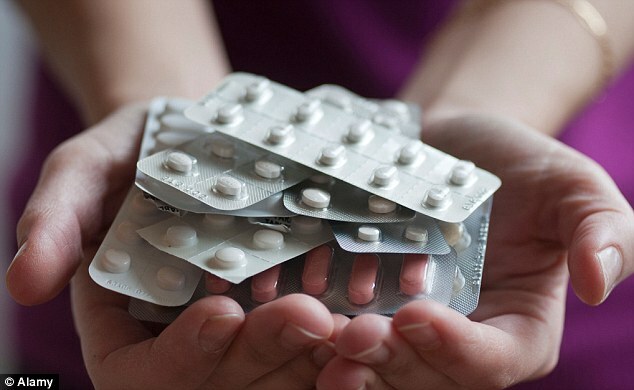 More than 62million prescriptions are written annually on the NHS, a 30 per cent rise in only five years. Experts warn that doctors are doling out the pills too readily, often just signing forms without checking patient details. 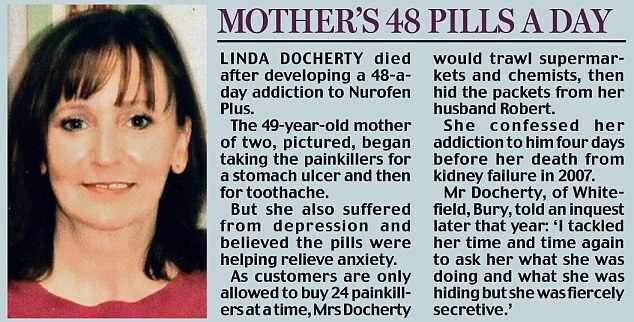 Figures show another six billion pills were bought over the counter last year, with sales growing at 4.1 per cent annually. But there are concerns that tens of thousands of adults – mainly women – are addicted to the drugs, having initially taken them to ease a minor ailment. One helpline estimates there are at least 32,000 painkiller addicts in Britain, although this is likely to be a fraction of the true number. Doctors and campaigners are particularly concerned about pills which contain codeine, an opiate from the same family as heroin and morphine. It induces a sense of relaxation and is included in popular brands such as Nurofen Plus, Solpadeine Max, Panadol Ultra and Syndol. NHS figures obtained under a Freedom of Information request show that prescriptions for codeine painkillers have risen by 45 per cent in three years. More than 2.5million are written annually, in addition to the estimated 27million packs sold over the counter each year. David Grieve, founder of Over-Count, a helpline specialising in addiction to over-the-counter medicines, said: ‘The attitude of the public to pain relief is that it’s just another commodity you buy in the shops. Mr Grieve said most of the callers to his helpline were women from middle-class backgrounds. He warned that many addicts are able to get painkillers too easily from their GPs, who often rely on specialist ‘prescribing’ nurses to write out the prescriptions. The latest NHS figures show that 62.5million prescriptions for pain-killers, known as analgesics, were given out in 2011. This is up 4 per cent on the previous year and a rise of 28 per cent since 2006, when there were 48.9million. Separate figures obtained by the Co-operative Pharmacy under the Freedom of Information Act show there were 3.5million prescriptions for codeine-based painkillers, up from 2.4million in 2006. And a poll of 2,000 adults carried out by the pharmacy found that one in four were regularly taking pain-killers because they were suffering from stress. One in five would not tell their friends or family they were taking the pills while one in six would keep it secret from their family doctor, if asked. Meanwhile the most recent figures from analysts SymphonyIRI Group show that 5.94billion painkiller pills were sold over the counter in the UK last year. As well as leading to addiction, the pills can have a number of other serious side effects, particularly if taken over prolonged periods. Paracetamol can cause liver and kidney damage while ibuprofen can lead to stomach ulcers.